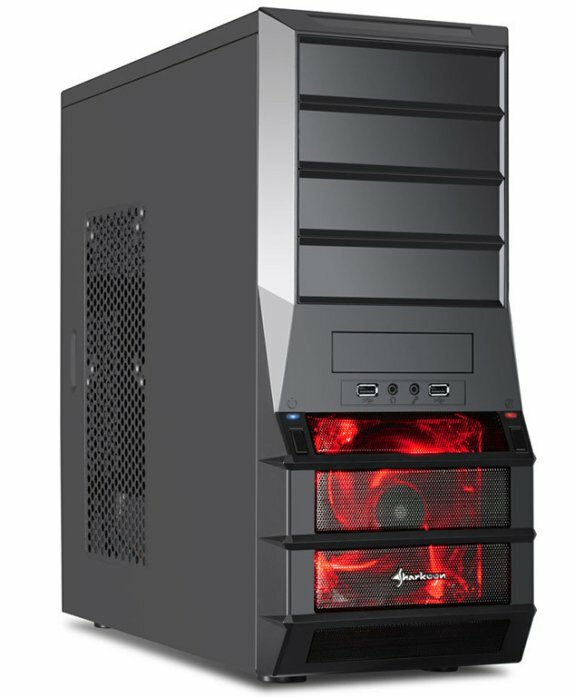 Sharkoon send out a press release to announce Vaya, a new 24.99EUR mid-tower case. Sharkoon presents a further model to their collection of PC cases for price conscious gamers and PC hobbyists. The Sharkoon Vaya combines functionality with an offensive design, and in the process establishes an excellent cost/performance ratio. The ATX case, built from SECC steel with a plastic front, is presented in a black exterior and interior finish, with an illuminating contrast from the red 120mm LED front fan. Positioned in front of the hard drive cage is a ventilator that sits behind a mesh air intake which protrudes from the front bezel, in order to not take up inside space. To strengthen cooling performance, an additional 80, 92, or 120mm size fan can be installed on the backside as well as a 120 or 140mm fan on the left side panel. 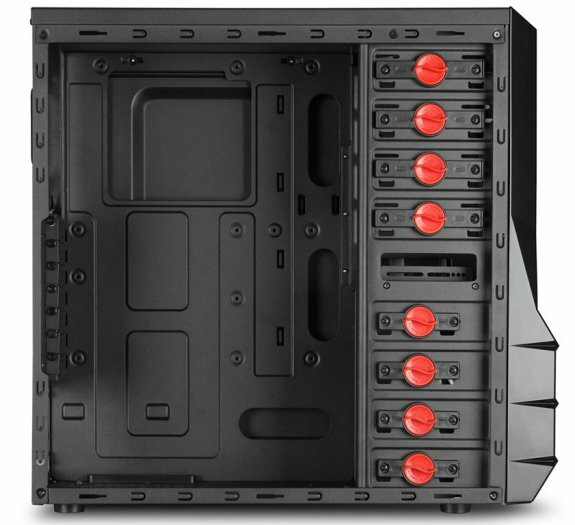 With four 5.25" and internal 3.5" bays, as well as an external 3.5" drive bay, the Sharkoon Vaya offers sufficient installation possibilities for hard drives and optical drives. In addition, there are seven extension card slots. Optical drives and hard drives are secured with the practical quick-locking clamps. The main board tray is equipped with a cooler mount opening and feedthrough for an orderly cable assembly. The fitted ATX power supply is mounted on the bottom of the case. Available on the front I/O are audio terminals and two USB2.0 ports. In the backside you will find two rubber-protected feedthroughs for water cooling tubes. The Sharkoon Vaya measures 465 x 185 x 440mm (L x W x H) and empty weight is 5 kg. Shipping includes a comprehensive accessory kit, while a detailed instruction manual is available for download on the Sharkoon website. End customers will find the Sharkoon Vaya available immediately for the suggested retail price of 24.99 euros from authorized retailers.